I actually made this bread back in January but saved it because I knew I wouldn't be getting much cooking/baking done this spring while we're trying to finish up work and school before our big move. This was a fantastic bread! I love how high it bakes up, and it has a great flavor. The dough was super easy to whip up using my stand mixer. This is one of the instances when I love having an oven-safe instant-read digital thermometer - I just sat back and watched the temperature rise, knowing that I'd have a perfectly baked loaf of bread in the end. I definitely plan to make this again! 1. Adjust on oven rack to the lowest position and heat oven to 200F. Once oven reaches 200F, maintain the heat for 10 minutes, then turn off the oven. 2. Mix 3 1/2 cups of the flour and the salt in the bowl of a stand mixer fitted with a dough hook. Mix the milk, water, butter, honey, and yeast in a 4-cup liquid measuring cup. Turn the machine to low and slowly add the liquid. When the dough comes together, increase the speed to medium and mix until the dough is smooth and satiny, stopping the machine two or three times to scrape the dough from the hook, if necessary, about 10 minutes. Note: After 5 minutes of kneading, if the dough is still sticking to the sides of the bowl, add flour, 1 Tablespoon at a time and up to 1/4 cup total, until the dough is no longer sticky. 3. Turn the dough onto a lightly floured work surface; knead to form a smooth, round ball, about 15 seconds. 4. Place the dough in a very lightly oiled large bowl, rolling the dough around the bowl to coat lightly. Cover the bowl with plastic wrap and place in the warmed oven until the dough doubles in size, 40 to 50 minutes. 5. Gently press the dough into a rectangle 2-inch thick and no longer than 9 inches. With a long side facing you, roll the dough firmly into a cylinder, pressing with your fingers to make sure the dough sticks to itself. Turn the dough seam-side up and pinch it closed. 6. Place the dough seam-side down in a greased 9 x 5-inch loaf pan and press it gently so it touches all four sides of the pan. Cover with plastic wrap; set aside in a warm spot until the dough almost doubles in size, 20 to 30 minutes. 7. Keep one oven rack at the lowest position and place the other at the middle position. Heat oven to 350F. Place an empty baking pan on the bottom rack. Bring 2 cups water to a boil in a small saucepan. Pour the boiling water into the empty pan on the bottom rack, and set the loaf onto the middle rack. 8. Bake until an instant-read thermometer inserted at an angle from the short end just above the pan rim into the center of the loaf reads 195F, about 40 to 50 minutes. 9. 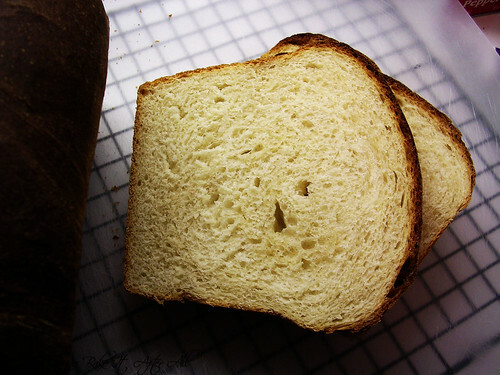 Remove the bread from the pan, transfer to a wire rack, and cool to room temperature. Slice and serve. Looks awesome! I actually just bought a new loaf pan and have been wanting to make sandwich bread to break it in. Your bread looks delicious! I will have to try it soon!!! Thanks for the recipe! That is gorgeous! It has a really nice texture! I bet it made great toast and sandwiches. I made an oatmeal bread not too long ago and used a thermometer. 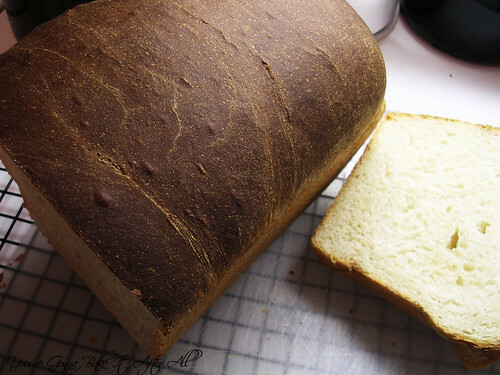 I loved knowing I could rely on the thermometer to know when the bread was done and not risk ending up with a doughy or dry loaf. 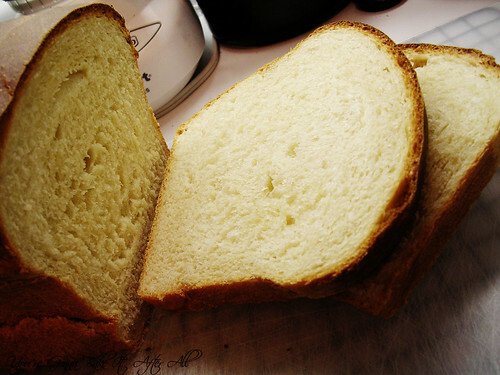 I like the idea of making white sandwich bread... it's definitely versatile. After reading this post I realized that at the bakery I used to work at we didn't have anything with "American" in its title. We had French Batard, Russian Rye, English Toasting, Irish Soda, Italian White-there had to be something American in that bakery-we carried over 100 breads! I'd have to say that baking bread is one of my least favorite tasks to attempt in the kitchen because everything needs to be exact..however, nothing beats the smell of it! So on days when I have patience, I give it a shot! Yours sounds/looks super!